Well, Valentine's day is coming. It's really not a big thing for me to show someone I love them on that specific day, but you know what is? Showing love to myself! Taking care of myself by taking some time to relax and pamper myself. So this year instead of spending the big day at a restaurant, I'm going to be spending time in my bathtub! There is nothing more relaxing than a nice hot, herbal bath with a good book and a candle flickering nearby. I have several different types of herbal baths I like to mix up. Some of these recipes are really simple and other require quite a few ingredients. If you don't have exactly what I use, in many cases other herbs or salts can be substituted. Don't worry though...I'm going to give you a whole list of bath additions and benefits of each to save and/or print out! 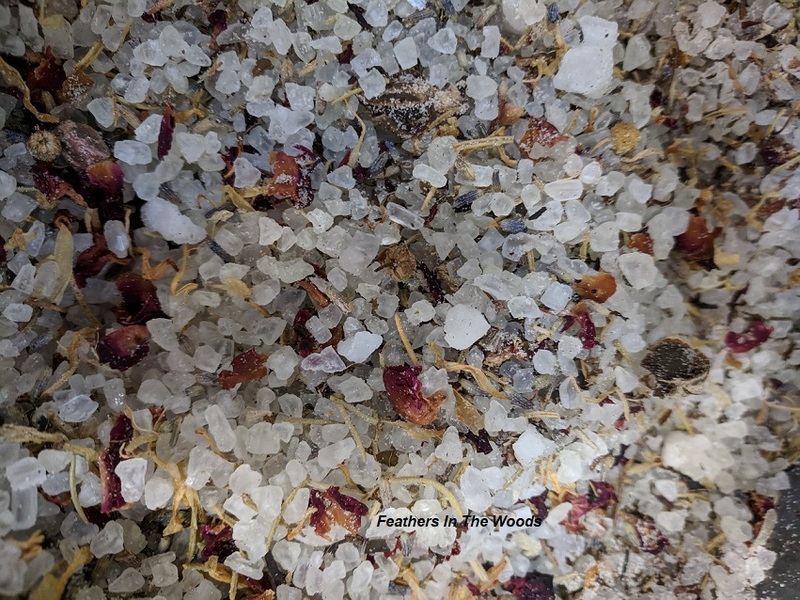 The beauty of the herbal bath is that you can often make it work with what you have on hand. There are lots of things you can add to your bath and many of them are beneficial to both your skin and your health! Herbs, spices, different types of salts and oils and even pantry staples can all be found in commercial bathtub mixes. You can make the same thing at home though, for a fraction of the price! What can you add to your bath? Almost all bath additive fall into 4 categories. 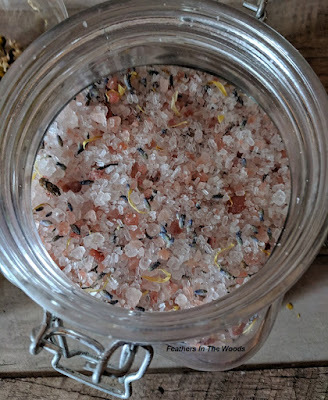 Salts: Epsom salts, sea salt and himalayan salt are all very relaxing to soak in. These are available in every grocery store or you can get exotic and pick up some special dead sea salts if you prefer. You can chose to do just a salt soak or pick a salt and mix it with some herbs and/or oils. Flowers and herbs: This is very similar to what I do when I make a sunburn tea bath. It is simply herbs, spices or flower petals. You can either float them on top of the water or use a small bag. I like to use a bag to make tub clean up easier. Foods: Oatmeal, honey or even milk can be added to the bath. Although these are normally thought of as just foods, they are also wonderful bath time additions that can leave your skin feeling absolutely silky. You can use these items alone or add dried herbs to them. They generally don't blend well with salts though. Quick tip, use a small mesh or muslin bag for the oatmeal or you'll have it sticking to every part of your body...and clogging the drain. Carrier oils and essential oils: Oils are great for soothing dry skin, and adding essential oils to your bath makes for a great aromatherapy experience. Oils can be used alone, added to salts, herbs or both! If you are making up a large amount of your favorite bath soak I don't recommend adding these to the bath mixture just yet. If you add oils to a bath salts mix and try to save it for later, you'll open it to find an oily smell. It won't quite smell rancid, but it won't smell like your pretty (and costly) EO's either. So while I absolutely LOVE essential oils for a scented bath, don't add these till right before you use it. If you are using an essential oil you must dilute it with a bit of carrier oil first. Otherwise it will evaporate too quickly and you won't be able to reap the aromatherapy benefits. This also helps it to dissolve more evenly into the bath water. 1 cup coarse sea salt. 1/2 cup dried rose petals. 1/2 cup dried calendula petals. Mix in large container and close tightly to store. Use 3/4 cup per bath. Pour into mesh bag and tie tight. Drop the bag into the bath once it's halfway full. 1 cup coarse himalayan sea salt. Mix in large container and close tightly to store. Right before bathing, scoop out 1 cup and put into a small bowl. Add 2 tbsp sweet almond oil and 6 drops lavender essential oil. Mix well. Pour into mesh bag and tie tight. Drop into bath right before you get in. Stir the water after a minute or so to mix. 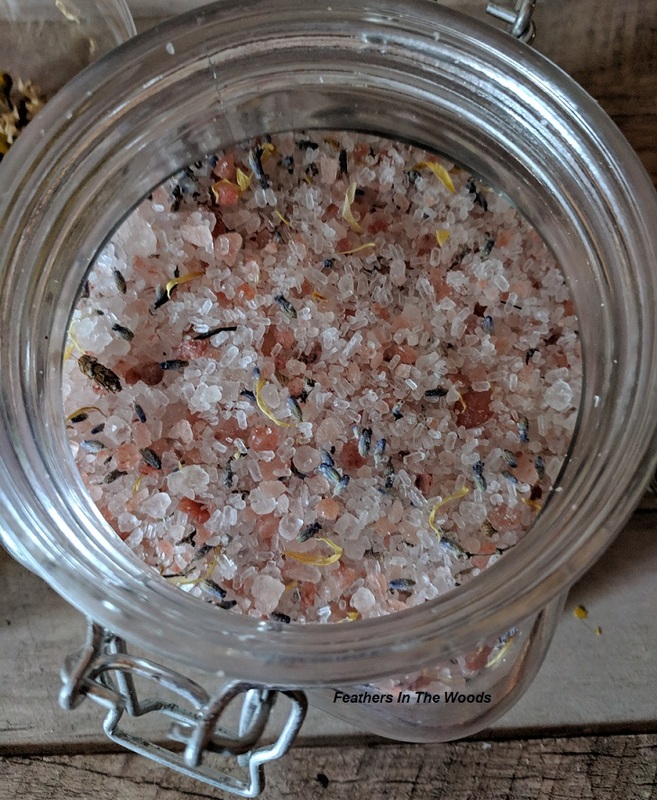 I made a complete list of herbs, oils, salts essential oils and pantry items that you can add to your bathtub. It's a 2 page list that you can download and save or print. Click here to get your list. Related reading: Want more information on herbal uses in everyday life? Check out this collection of articles on using herbs daily. I am not a doctor or other health care professional nor do I claim to be. I am not trained in any medical field. I am simply passing on information that has worked for me. This information is for entertainment purposes only and is not meant to treat or diagnose any medical condition. Please see a Dr if you are ill. Click for my full disclaimer. YES!!! I love taking baths with all kind of salts and essential oils. I'm into bath bombs lately. I'm loving the scents and relaxation, especially a hot bath on a cold night. Can't wait to try these combinations. Thank you! You're welcome! I love bath bombs too, they're so much fun..and I totally agree on the hot bath. It's definitely been good weather for it! I wonder about the excess chemicals in bath products we buy from the store. I wonder if the preservatives are bad for us? I mean they can't be good! I much prefer to mix my own bath salts and herbal bath teas! I love essential oils. I add a little in my body wash because my skin is really sensitive. 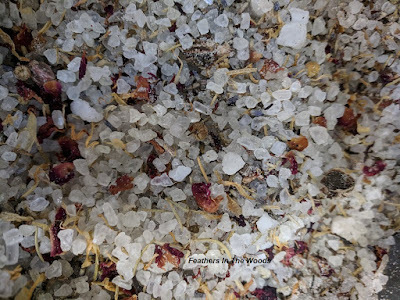 These DIY herbal bath blends must be as fun to make as they are relaxing! I have yet to try this, but I want to now! Great way to incorporate it in my daily routine! You should definitely give it a try! 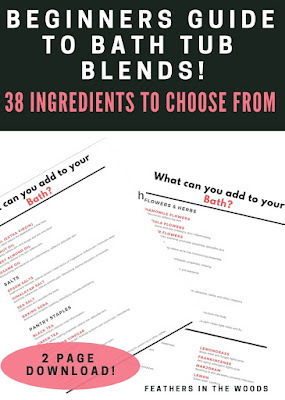 Making your own bath blends is a great way to keep control of what chemicals your skin comes in contact with. It is our largest organ and most commercial products are loaded with chemicals.